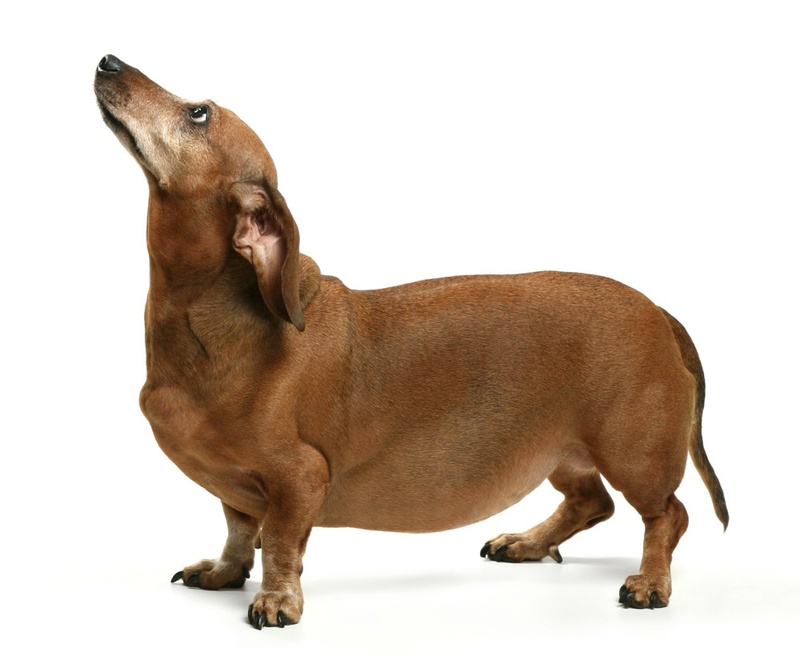 So … you have yourself an overweight dog. Regardless of why your dog may have packed on the pounds, the great thing about being aware your dog is overweight, is that you can start taking action. Start off by consulting your vet to find out your dog’s current weight and to get help developing a weight loss strategy. Reduce calorie intake. It’s a simple mathematic equation: too many calories in + too little energy out = one overweight dog. 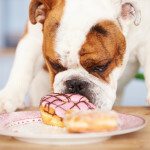 The first step towards reducing your dog’s weight, is to reduce their calorie intake. That doesn’t necessarily mean you should drastically cut the size of your dog’s meals, it’s more about making sure they’re enjoying high quality, nutrient dense food. 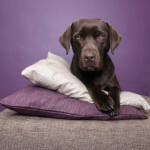 Many commercial dog foods contain fillers that add calories but not nutrition to your dog’s diet. A whole-food based diet, high in protein and balanced out with suitable vegetables is a great way to ensure your dog feels satisfied, without being weighed down by empty calories. Add Dig-In Digestive Gravy to your dog’s meals to boost the nutrition and increase the yum! Get daily exercise. Exercise forms an important part of any weight loss program. Consult with your vet prior to commencing any regular or increased exercise program, particularly if your dog is very overweight. If your dog has been more couch potato than live wire, it’s best to start with short walks, gradually increasing the distance and speed of each walk. A daily walk can be supplemented with active game time such as playing fetch, tug-of-war, or chasing a favourite toy. In colder months or rainy weather, you can still exercise your dog indoors by playing a game of hide-and-seek or running up the stairs. Change your treats. We give our dogs treats for many different reasons – as training rewards, to keep them entertained, or just because they’re great at looking cute! Of course occasional treats are fine, but it’s important not to overdo them. Many commercial treats are highly processed, with large amounts of added sugar, salt and fat. Consider trying healthier snack options such as small cubes of cooked pumpkin or steamed green beans. Your dog can also be treated in many non-food related ways, such as playing a game, verbal praise, or with pats and cuddles. Control portion size. 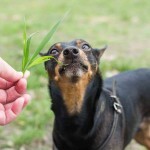 Rather than have food freely available for your dog to graze on, stick to defined meal times – either one a day or split into two smaller portions. It’s also a good idea to measure out (or weigh) how much food you’re giving your dog, rather than guessing. This helps you to better monitor their food intake. Feeding guidelines on dog food packages only provide a general guide for the amount of food to feed your dog, but it’s far better to consult with your vet about how much is right for your dog. If you have a multi-pet household, supervise feeding time so that your dog is not also cleaning up everyone else’s food bowls too (an easy way to sneak in unwanted calories). Keep good records. As losing weight isn’t a quick process, it’s important to monitor your dog’s progress by keeping track of their food intake, exercise and weight changes. 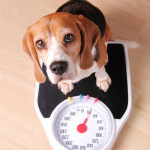 This allows you to determine whether any adjustments need to be made to your dog’s weight loss plan. You can take this information with you when you next visit your vet to evaluate your dog’s progress. Once your dog’s weight is back within a healthy range, any weight-related health problems will be alleviated and you can switch over to a weight maintenance plan with your vet’s guidance. It’s important to remember that just as weight gain doesn’t happen overnight, neither does weight loss. There are no quick fixes, just consistency and time. You want your dog to live a long and happy life, so focus on making sustainable lifestyle changes which make exercise and healthy food an ordinary part of your dog’s daily routine.